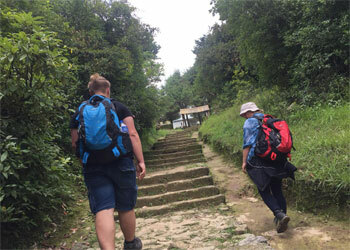 Dhampus Australian camp Hiking is one of the most admired hiking routes in Nepal which passes all the way through countryside populated by a broad diversity of people and diverse geographical landscapes. Dhampus valley is situated at the range of 800 meter which is also a gateway to Annapurna Conservation Area. The hiking to Dhampus continues through magnificent rhododendron forests which are also home to many flora and faunas. The trail offers you superb Himalayan panorama view consisting of the mighty peaks such as the Annapurna, Himachali, Machhapuchhare, and Lamjung Himal. Hiking to Australian camp begins with 1 hour drive to Kande. On the way, we will have the spectacular view of the Annapurna Himalayan range. Sarangkot village is perched on the North West of Pokhara with enchanting views of Pokhara Valley and the Phewa Lake. We will witness the sunrise over the White Mountains of Whole Annapurna and Dhaulagiri Ranges including fishtail from Sarangkot tower during our Pokhara Dhampus Sarangkot hike. Enjoy and explore the Wonderful city Pokhara. You have very great short and easy hiking trail during your walk that is undoubtedly going to leave a footstep in your heart. Best Travel Time: This hiking can be done throughout the year, Mid June to August is rainy season and advice to take umbrella/raincoat. Day 01: - Pokhara to drive to Kande hiking to Australian camp (1880m) and Dhampus (1650m). about 3 and half hour hiking. After breakfast about 1 hour drive takes us to Kande the starting point of this hiking. The trail starts from here to Australian camp, it is nice and gentle climbing walk with great view .It takes one hour half walk to reach Australian Camp from Kande. Australian Camp is a beautiful village best known, where on a clear day you can see an unobstructed view of the Himalayan Mountains of Annapurna range, Machhapuchhre, Manaslu range and also beautiful green hills.we can have lunch and short break here, make pictures and trek down to Dhampus. . The trail from Australian Camp to Dhampus is very nice. We walk through jungle. If it is bout e1 hour downhill trail takes you to Dhampus a typical Nepali village , Enjoy great Mountain view on a clear day. Day 02: - Dhampus hike Phedi and drive back to Pokhara. about 2/3 hour hike and 30 minute drive. Today we wake up very early in the morning for the stunning sunrise view over the mountains and the amazing Himalaya range. The trail descends down to the main part of Dhampus valley is on the top of the ridge, more than 500m above. The area is inhabited by Brahmins, Chettri and few Gurungs. Crossing the dirt road a couple of times and stone staircases makes the trail more adventuring. we will catch a private vehicle at Phedi and drive back to Pokhara. Twin sharing tea house/lodges Accommodation during the Hiking including breakfast. Necessary Hiking permits if applicable. Transportation from Pokhara to Hiking start point and hiking finish point to Pokhara by private vehicle.